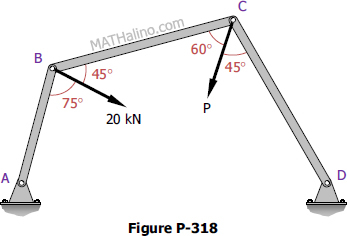 Determine the force in each member of the crane shown in Fig. P-413. Three bars, hinged at A and D and pinned at B and C as shown in Fig. P-318, form a four-link mechanism. Determine the value of P that will prevent motion. 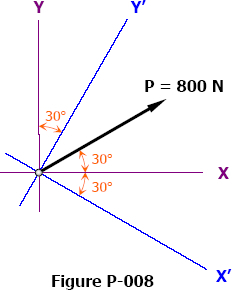 A 300-lb box is held at rest on a smooth plane by a force P inclined at an angle θ with the plane as shown in Fig. P-310. If θ = 45°, determine the value of P and the normal pressure N exerted by the plane. A cylinder weighing 400 lb is held against a smooth incline by means of the weightless rod AB in Fig. P-309. Determine the forces P and N exerted on the cylinder by the rod and the incline. The cable and boom shown in Fig. P-308 support a load of 600 lb. Determine the tensile force T in the cable and the compressive for C in the boom.